Written by administrator on May 27, 2001 to Live. EDITORIAL  We’re about to see the “Room Service” tour formally announced this upcoming week. With tickets already on sale for certain venues, and Per himself disclosing the Austrian dates, the fact that Roxette is indeed going on tour has been a badly kept secret. The Daily Roxette has, however, decided to hold off publishing further detail about the tour on our Front Page until the actual announcement. Until then, readers who “just can’t wait” will find rumors and factoids in our SmallTalk forum. In thinking about this tour, we wonder whether Marie would have toured Sweden last summer if there hadn’t been an online petition urging her to do so? Maybe so. But at the very least, the petition provided her management with a very good PR “hook” to give reporters to use when they announced the tour. They were able to say, “Marie’s fans are demanding it!” Such a hook played well in the Swedish press, especially in the tabloids. There was risk-taking involved in getting the trucks rolling for a “Room Service” tour. Obviously, there were many other factors that weighed more heavily than whether a core group of fans would enjoy seeing Roxette on tour again. This tour has to attract thousands upon thousands of people  people who would not necessarily consider themselves to be “fans.” Many others had to “buy in” to the idea of a tour besides Per and Marie, as the financial risks of a concert tour like this are high (as are, of course, the potential rewards). We know that Per skimmed through the petition that Sofia Björk and Judith Seuma created online and read some of the comments. Now that he, Marie, and all the other vested parties have decided to mount a tour… they’ll once again be able to point to the demand from fans… as part of the “hoopla” needed when the tour is announced. TDR appreciates the involvement of our readers, most of whom took the time to “sign” this petition. We think it was a worthwhile endeavor, and like the way that fans come together to support “causes” like this. While it may be a little geographically spotty, one only has to look at other articles on our Front Page to see that Roxette has other plenty of other successes to point to when announcing the tour. The Daily Roxette wishes them well, and looks forward to providing our readers with full coverage of the entire “Room Service” tour. Written by Lars-Erik_Olson on May 25, 2001 to Live. Written by roxeteer on May 25, 2001 to Live. Roxette will have their first live concert in Estonia on November 10th, two days before traveling 80 kilometers north to Helsinki. The concert will be one of the first to take place in Tallinn’s brand new sports and concert complex, the Saku Suurhall, which is in its final stages of construction. Written by roxeteer on May 22, 2001 to Live. Roxette is not starting their European tour in Helsinki, as they’ve done on all of their major tours so far. Instead, the tour will start in Germany in September. Roxette’s Helsinki concert will take place at Hartwall Areena on November 12th. According to Welldone, the company organizing the concert, the doors will open at 6:30 pm and the concert begins at 8pm. Ticket sales will start on May 29th at 9am. Advance sales for members of Welldone Events Club has already started. The price of tickets ranges from 225 FIM to 245 FIM. Written by Lars-Erik_Olson on May 22, 2001 to Live. 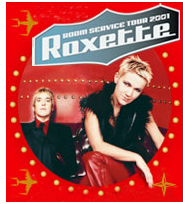 TDR BREAKING STORY  Without even a press release  let alone a press conference  to formally announce that a tour is planned, tickets for certain venues of Roxette’s upcoming “Room Service” tour have already gone on sale! As first reported in The Daily Roxette weeks ago, Roxette and EMA Telstar have decided to mount a European tour. Dates and venues for the autumn tour are being added  Per has said that the rest of the dates are 99 percent in place  and it is expected that a formal announcement will be forthcoming Tuesday, probably at a press conference in Stockholm. TDR learned today (see story above) that the tour will begin in Germany in late September and that the concert date for Helsinki will be November 12th. Last week, during an online chat session in Austria, Roxette announced these two dates: November 1, Innsbruck and November 2, Vienna. Yesterday, tickets went on sale for an October 22nd performance in Brussels at the circular-shaped Forest National concert venue. The general admission tickets cost about $35 USD with fees included. The “Room Service” tour will take Per, Marie and the band to most of Europe’s major cities. EDITOR’S NOTE: TDR will, of course, publish additional tour particulars as soon as they become available (Peter Aspeslagh and Visa Kopu contributed to this article). Written by mattias on May 21, 2001 to Live. The thing is, that no one ever plays live at Bingolotto! In this reporter’s opinion, Roxette doesn’t perform using playback more than anyone else! Written by dubacik on May 15, 2001 to Live. Roxette will be performing live on Swedish TV show Bingolotto next Saturday. The show is broadcasted on TV4 at 7pm CET (UTC+1). Bingolotto is a Swedish competition where you can win money, cars, holidays and many other things. The show is hosted by Lasse Kronér. Written by martin_nl on May 11, 2001 to Live. “Stars 2001 - The Popkomm.Gala” on August 15th marks the official start of the European trade show for Pop Music and Entertainment that takes place in Cologne from August 16 - 18. Acts besides Roxette confirmed to appear on stage at the Cologne Arena include Anastacia, Echt, Kylie Minogue, No Angels in a duet with Hear’Say, Ronan Keating, and Die Söhne Mannheims. The large-scale show is being produced for the first time in cooperation with the German SAT.1 channel and VIVA music TV. The show will be transmitted on Friday, August 17, during prime time at 8:15 p.m. on SAT.1. Written by Lars-Erik_Olson on April 30, 2001 to Live. “I can reveal that we’re negotiating a European tour, since their album is doing really well on the Continent and sits at number one, two or three in several countries,” said Tomas Johansson, head of EMA Telstar, in an interview published Satuday in the Swedish newspaper Dagens Industri.